This recording gives all the secrets of grafting or pitching. Walt reveals the secrets that enabled him to earn a handsome living pitching such items as Svengali decks, the coin and glass, three card trick, and other tricks of the grafter's trade. You will find everything from the grafter's own language and terminology, to the pitches, and how to make the products. Walt Lees is a born pitchman. His voice draws you in. It plays with your mind, you are getting interested, intrigued, fascinated, excited, until you can't hold it anymore - you must have this trick - you buy it, and the pitchman made a sale. Walt holds probably the world record in pitching Svengalis. During one week he sold together with a friend 3000 Svengali decks. 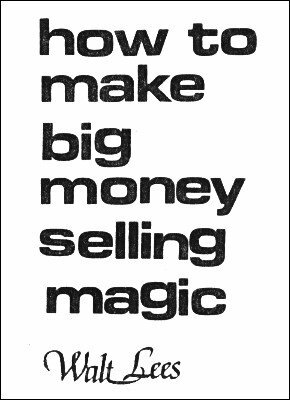 You will receive all the information and secrets to make a living selling magic to the public. Given the dire world economy this can be a fun way to add a secondary income to help in tough times. This was originally released as a two volume tape by Martin Breese. Copyrights are now owned by Lybrary.com.